Nakisha VanderHoeven is an artist living in Seattle. She had already designed the Rabbit, the TaRat, and the BlueDogRose tarots. 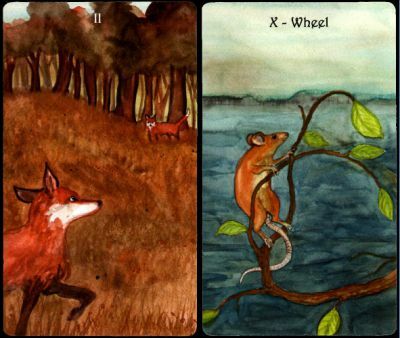 In 2013, she published the Badger Forest tarot with 78 watercolour illustrations. This pack had taken over three years to complete. I distinguished this pack from many others not only because of the illustrations but also because the suit signs have been replaced by animals (badger, fox, rabbit and crow). Other animals appear in the trump cards. The card indices are alas misplaced for players (centre top for pip cards and trump cards, left bottom for court cards) which means that this pack has been designed for fortune telling.